This post has already been read 1823 times! Those words have appeared at the top of Ciera Clark’s bio since she joined the University of Nebraska at Kearney women’s soccer team. It’s a quote she discovered during her senior year at Omaha North High School, the type of inspirational message every Loper soccer player is asked to share. What Clark didn’t know four years ago is how accurately this phrase would define her time at UNK. 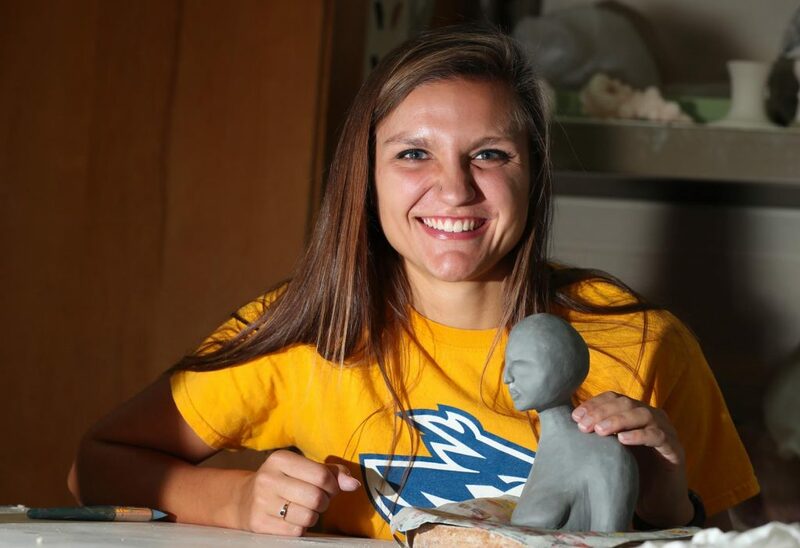 She came to UNK with high aspirations following an outstanding high school career in which she was twice named Class A honorable mention all-state, recording seven goals and three assists as a co-captain in 2014. 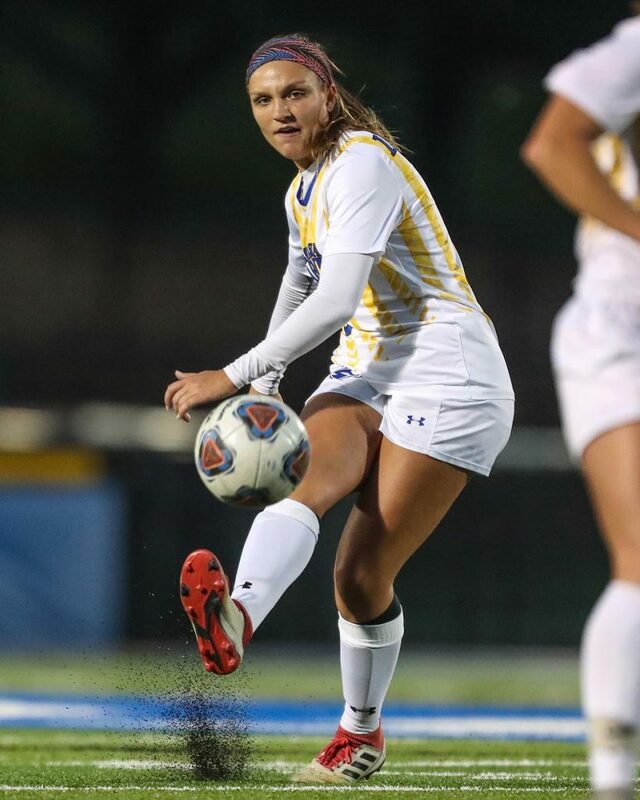 Clark, who also played for the Gretna Galaxy club team, knew at a young age that she wanted to reach the collegiate level, and a scholarship offer from UNK gave her that opportunity. But the transition was far from smooth. The 5-foot-6 forward appeared in 11 matches as a freshman, including one start, and attempted a single shot. She was frustrated, unhappy and ready to transfer, but decided to remain with the program. Her sophomore season was another step backward as an injury limited Clark to just six matches. “My first two years, they weren’t the best for me,” Clark said. She had a decision to make – give up, give in or give it all you’ve got. Clark spent last season “working on me,” as she describes it, and began to find her way under new head coach Chloe Roberts, recording five shots, including three on goal, while playing in 16 matches. “Chloe was kind of a comfort for me,” Clark said. Roberts, a native of England who joined the UNK coaching staff as an assistant in 2014, knows what it takes to succeed at the Division II level. She was a four-time All-American at the University of North Alabama, where she scored a school-record 93 goals and was named the Daktronics Division II Player of the Year in 2011. The second-year head coach noticed one major change as Clark prepared for her senior season. “She’s just become more and more confident,” Roberts said. Her new mindset paid immediate dividends. Clark took five shots and scored twice in UNK’s third match of the season, a 2-1 victory over Montana State University Billings in the Rimrock Classic. She’s one of just eight Lopers all-time to net two goals in a game. “It’s still kind of unreal,” Clark said of the performance. 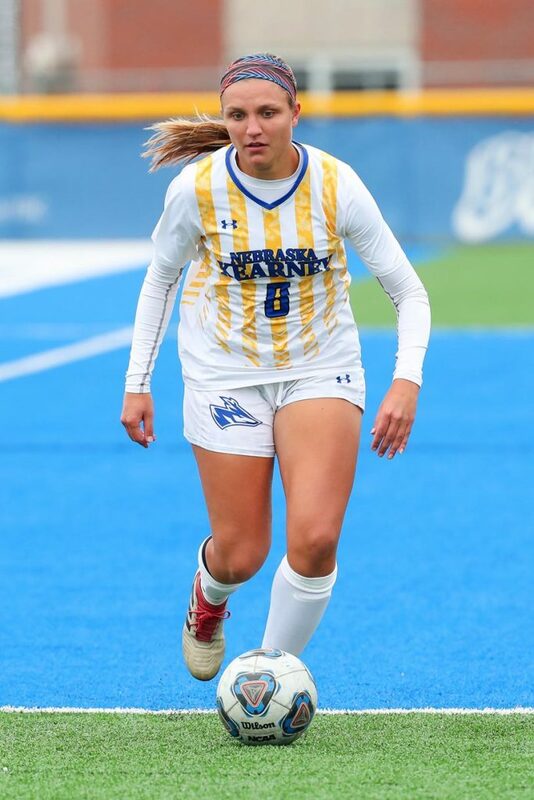 Three weeks later, her header with less than a minute remaining in double overtime gave UNK a 2-1 win over visiting Northeastern State University. Clark collided with the goalkeeper on the play, and didn’t realize she scored the game-winner until she saw her teammates celebrating. “It’s a really good feeling, being able to help my team,” she said. After starting just four matches in her first three years at UNK, Clark has clearly established her role this season. She’s played in all 16 matches and started 12 of them. Clark leads the team with five goals, including two game-winners, and is tied with junior Maddie Love with a team-best 11 shots on goal. The senior is watching more game film, talking to her coaches and looking for ways to improve after every match. “It’s definitely showing on the field and it’s coming at a perfect time for her final year,” Roberts said. The UNK coach can list a lot of attributes that make Clark stand out, whether it’s her work ethic, willingness to sacrifice or positive attitude. “I could go on and on about Cici,” Roberts said. “She’s such an asset to this team and she brings a lot as a teammate and as a player to this program. Clark is focused on doing anything she can to help the Lopers, who are 5-10-1 overall and 3-5-1 in the Mid-America Intercollegiate Athletics Association (MIAA). UNK is currently ninth in the MIAA standings, needing to move up at least one spot with two matches remaining to make the conference tournament. Regardless of the season outcome, Clark is enjoying her final matches as a Loper and the camaraderie she’s developed with her teammates. Clark has another passion away from the soccer field, one that allows her to express herself in a completely different way. “Being on the field and being in a ceramics studio, I’m like two completely different people,” she said. The Omaha native fell in love with ceramics during high school after her older sister encouraged her to give it a try. The art studio is a “whole different world” for this lifelong athlete. “You get to create whatever you’re feeling,” she said. Clark uses art to address body image issues, depicting the female form in ways much different than what’s glamorized in today’s society. Her pieces send a message, letting viewers know there isn’t a specific blueprint for women. “Being an athlete, you’re supposed to look a certain way,” said Clark, who has watched friends and family members battle eating disorders and heard the nasty comments people make about women’s appearances. 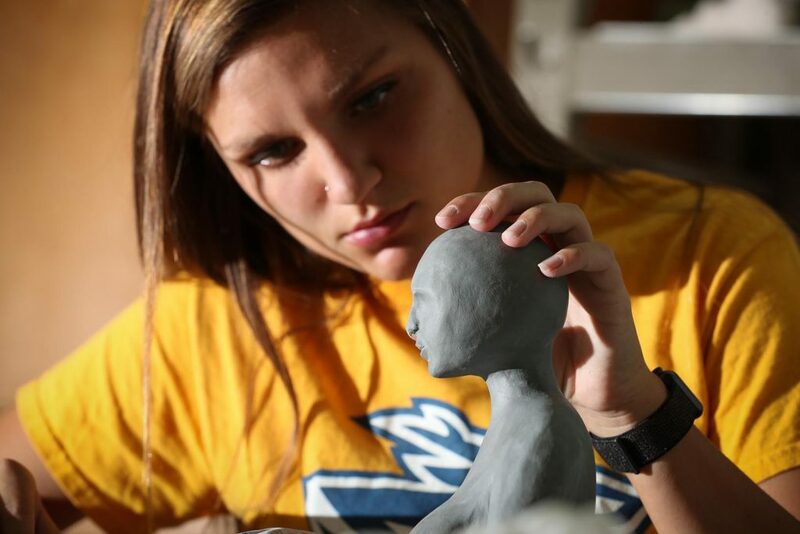 A studio art major with a ceramics emphasis, Clark wants her work to elicit emotional reactions that leave a lasting impact. “I’m going to hit you in the face with it,” she said. The Lopers play their final two regular-season matches this weekend at Ron and Carol Cope Stadium. UNK faces Fort Hays State at 2 p.m. Friday and Emporia State at 1 p.m. Sunday.